Okay, okay. So I don't particularly love the cowboy design on the cushions, but as they say in Mexico "para el gusto se hicieron los colores," which basically means "to each its own". 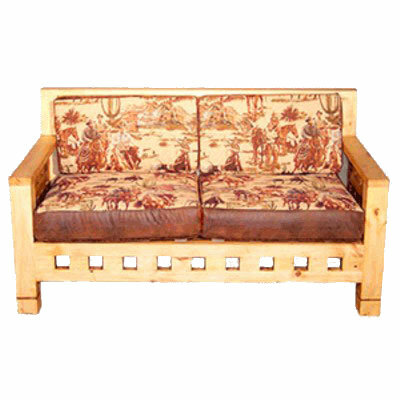 What I do like is the lovely design of the wood, hence the name: cubic love seat. If you are interested, please ask us to quote sofa, armchair and sofabed in this design. And we also have matching accent tables. You can order this piece in the fabric of your choice. Yes, that includes Sunbrella. If you love the cowboys, we can do that, too!